Scioto Signs is a custom screen-printer and metal fabricator. We are able to produce a wide variety of products with many options to create more visual impact and strength to our products. Below is a general list of capabilities, descriptions and sign tips you may consider when putting your projects together. This list should help you get more acquainted with our capabilities and the common terminology used in our industry. If you plan on submitting electronic artwork to Scioto Signs, here are a few things to keep in mind. Our Art Department accepts a wide variety of electronic files for both PC and Macintosh platforms. However, the best format to save your files is EPS file from either Illustrator, Freehand, or Corel Draw. With four-color process files, please be sure to submit a high resolution file that is equal or greater than 170 dpi at 100% full-size. If you are going to submit a file where the image is smaller than the size you want us to produce, the file resolution must be much higher. Please feel free to call Kerry James or Shane Rogers in the Art Department for more information. Scioto Signs stocks and prints on .024, .032 and .040 white & natural aluminum. Our aluminum is coated with a white or clear satin polyester coating suitable for screen-printing standard thermo-set inks. We buy our aluminum in 48" or 36" coil widths that are most commonly sheeted down to 144" in length. Aluminum is the most ideal substrate for outdoor use. For applications that require added strength and rigidity, .063 and .080 aluminum is also available. Natural clear brushed aluminum is a attractive substrate mostly used for indoor applications. 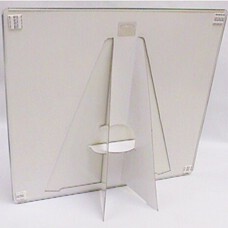 This material is very popular for counter display signs, hanging plaques and tacker signs. Also, combining our transparent lumalite inks and embossing really add visual impact to your project. We stock .024 clear brushed aluminum, but .032 and .040 are also available upon request. Commonly used for nostalgic reproduction signs, memorabilia and hanging signs. 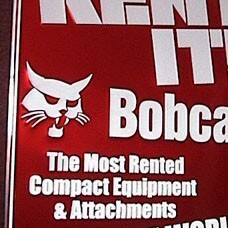 Although steel is not as durable outdoors as aluminum signs, steel is a very economical and dependable alternative. Steel signs are also great for magnetic signage such as menu boards and production schedules. We stock 27g. steel for tacker signs, large WBF signs and reproduction related signs, but 24g. and 18g. steel is readily available for larger hanging signs. Magnetic vinyl decals are great for vehicles. They are easily applied and removed whenever needed and stay affixed to the vehicle while in motion. We stock .030 white magnetic vinyl and commonly screen-print UV curable inks or air dry inks onto this material. Pressure-sensitive, or adhesive vinyl decals, come in many thicknesses, with various adhesive and liner properties. Scioto's standard decal material is 4 mil ELV white vinyl and we have found works with most applications. For special applications, we will advise and purchase the correct material. 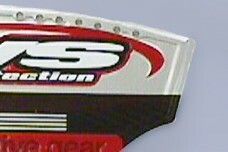 Most decals are screen-printed with UV curable inks. Hardboard is a very rigid material that is used well with pegboard style signage. Scioto Signs stock .25" hardboard which is cut to specified size and is coated white suitable for air dry inks. Corrugated plastic is an inexpensive way of advertising indoors or out. Most often screen-printed with UV curable inks, these signs are best for short term promotions and seasonal agricultural field signs. Corrugated plastic, 4mm and 10mm is readily available. White styrene sheet stock is very thin and light weight and works well in most retail environments. White styrene .020, .040 and .060 is readily available for screen-printing with UV curable inks. Scioto Signs is a custom screen-printer utilizing multiple press lines and the latest printing materials to ensure you the best sign available in the industry. For outdoor durability, Scioto Signs still uses thermal-setting (Baked) polyester inks on our metal related products. Our other substrates are commonly printed with UV curable or air-dry inks. 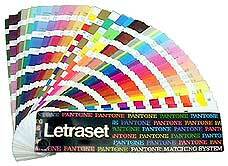 PMS stands for Pantone Matching System and is known as the standard for color identification in the graphics industry. If you know the PMS numbers needed for your designs, we guarantee that we’ll match it for the production of your signs. If you don’t know the PMS number, we can supply you with standard color chips or we can match the color you supply. Lumalite is a unique process of screen-printing a transparent PMS color over the natural mill finish aluminum to give the sign an extra brilliance and luster. If you are interested in learning more or would like to see samples, please call or email us. Four-Color Process printing involves duplicating photographic images and multi-colored designs with (4) distinct halftone colors… cyan, yellow, magenta and black. Scioto Signs is a very accomplished four-color process screen-printer and we have produce some of the most attractive four-color process signs in the industry. If you have a four-color process project and would like to see some of our sample work, please call or email us. To give your signs an extra gloss & luster, Scioto Signs applies a varnish coat after the product has been screen-printed. This makes the sign much more attractive and adds some additional protection against color fading. Embossing is the process of stamping our metal signs to raise your artwork from a normally flat surface. This creates a more attractive and interesting sign and makes the sign stronger and more rigid. Depending on the artwork, we can emboss our metal signs with two types of tooling to create a soft and/or sharp emboss appearance. Soft embossing is generally used on larger signs with basic artwork to create a “pillow-like” appearance. Although our standard soft embossing involves one level of raised artwork, we can also create signs with multiple levels of embossing for added impact. Sharp embossing is typically reserved for smaller nameplates and finer detailed artwork. 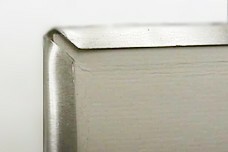 When stamped, it creates a very crisp or “sharp” edge on the artwork that is raised. Similar to our embossing process, we can stamp the metal sign with hard tooling on the edges to make a picture window. This creates a clean border or frame around the main artwork. A sign with a stamped frame has a more refined and stylish appearance than a standard soft embossed edge and is more suitable for showroom or other indoor retail environments that demand a higher level of quality. Soft or sharp embossing can also be combined with this process for added appeal. Instead of a standard sign that is designed with four straight edges like a square or rectangle, die-cutting is the process of punching a special shape out of the material like circles, ovals or the contour of your artwork. Die-cut signs demand more attention and are typically more interesting and attractive than standard straight edge signs. Additional tooling charges may apply. If you’re interested in adding this to your sign and want to learn more, please call. 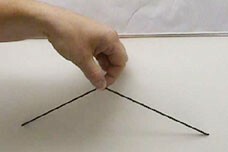 Flanging and hemming relates to how the sign is folded or bent. A flange is typically a 90° bend used for double-face signs. Hemming is a 180° fold generally used for plaque signs with inserted cardboard backers. Scioto can bend the edges of your sign many ways to achieve the desired results. If interested, please call or email to learn more. A color bleed is when your artwork is designed to have a background color or an image run-off the edge of the sign without any kind of border. If you wish to have a color bleed, Scioto will print your artwork on slightly larger material and then trim all the edges back to make the color show right to the edge of the sign. For cost savings, design your artwork with a small white (or natural aluminum) border. For night visibility and impact, make your signs reflective! Reflective signs are a very economical alternative to illuminated signs for night visibility and advertising. They are designed so that when headlights or any other light source strike the sign, your message glows brightly attracting a captured audience. If you’re interested and want to learn more, please call or email us. Some retail establishments or showrooms prefer not to see any type of hanging hardware like nails or screws. A very attractive alternative is a plaque sign with a hanging cord installed in the back of the sign. Hanging cords are available in many colors (standard is black). Making a sign adaptable to many environments increases the odds your dealers or retailers will display your sign. An easel back is a great option to add to a standard wall sign that allows it to be displayed on a counter or shelf. Grommets, or eyelets, are typically used to reinforce mounting holes on hanging signs. Overtime, standard drilled or punched holes will tear from the natural swinging motion of the sign. 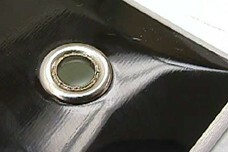 Silver or Brass grommets are available in a variety of sizes. For added strength and durability on larger signs, consider utilizing a wood-back frame. WBF signs are constructed with 1x4 treated lumber boards and are installed on the backside of the sign. They save installation time and are very effective for roadside signs and building identification. Instead of mounting holes, some retail establishments prefer double-stick adhesive foam pads on the back of their signs. This allows a sign to be displayed without any exposed hardware such as screws and nails and also makes it simpler to mount to a wall. Our Products | Our Capabilities & Services | Who to Call? | Request a Quote!